The game of No Limit Hold’em has been over complicated throughout the years. This is why many amateurs fail to make a profit in cash games. It is important to understand that imitating a play you saw by a professional, on a high stakes table, will almost certainly result in failure. People have forgotten the basic poker strategy, as it was played 20 years ago, in its pure and simple form, expressed in a variety of books for Doyle Brunson’s “Supersystem” to Dan Harrington’s “Harrington on Hold’em”. In modern low stakes cash games, the field is filled with amateurs, which are just begging to pay you off. Complex moves, plays and bluffs sometimes get in the way of the main idea, which is to make a profit. Playing basic poker strategy is perfect for beginners aiming to make a profit, and for advanced players keeping their variance low whist playing the loose low stakes. 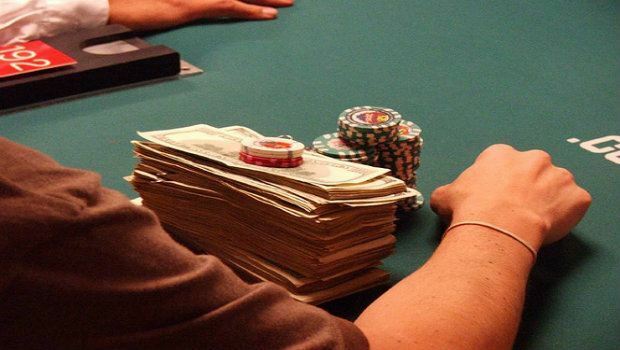 This guide should provide all the basic information you need to achieve the basic cash game strategy, from the minute you cash-in to the time you cash-out. The first aspect of playing basic poker strategy is how deep to buy-in to the game. Many of you may opt for the simple 100 Big Blind buy-in, but don’t forget that buying-in deep or short has its advantages and disadvantages, and if used correctly can be used in order to obtain larger profits. Playing the Short Stack (50 Big Blinds) : When buying-in as a short stack you have the advantage of doubling up easier than other players. The reason is that deep to your low stack, after a couple of bets, your opponents become committed to calling your all-in. Despite the fact that they know they are probably behind. The disadvantage is that you don’t get a chance to see raised flops with suited connectors and small pocket pairs, which could pay off. Playing the Deep Stack (200 Big Blinds) : When buying-in as a deep stack you have two main advantages, one being that you can act as the big stack bully and you can afford to play coin-flips preflop or follow-up draws post flop. A big stack bully will raise with a wider range pre-flop putting your opponents in difficult position. Playing coin-flips is expensive, but when you hit its worth it. So you’ve set your chips on the table in front of you. You’re under the gun and you pick up QJ. Should you call? The answer is no. It is highly advised that you sit back for the first couple of rounds and study your opponents. Try to pick up some tells, how they act when they are bluffing, how they act whilst they have got a genuine hand. You should be able to tell the Fish from the Sharks after the first couple of rounds. Two factors that will help you identify the amateurs from the pros are amateurs complain a lot and play a lot of hands. The first thing we should mention is that you should try not to get involved with the professional players on the table. Get involved with the amateurs, which are more likely to pay you off when you have a hand. The second factor, which you should acknowledge, is position. Position, in poker, is the advantage you gain when playing an opponent who has called pre-flop out of position, where the player who holds position gets the opportunity to act last. This allows the accumulation of information from his opponents, either by physical tells or by his act of checking or betting. So try to restrict your range of pre-flop holdings to the dealer seat, cut-off, or a late-middle position. This way you will always have the post-flop advantage against your opponents. The third and most important factor that determines pre-flop play is the range of holdings you choose to enter pots with. To be successful in basic Texas Hold’em Cash Game strategy, you have to be very selective on your starting hands depending on a variety of situations. To get an idea of how you should be playing, you should raise with any holding above KQ suited from late positions, and call with any suited connector or small pocket pair (under 99) when the price to enter is under 5 big blinds. When there is a raise from a professional avoid entering the pot with anything less than AJ-AQ because if you connect with the flop you might find yourself paying off your opponent who holds a greater kicker. In order to achieve maximum success in this basic poker strategy, you must be efficient in playing a correct pre-flop game. Two important lessons you should remember is that you shouldn’t bluff a calling machine and secondly don’t try to value bet the pros. If a professional feels your value betting weak he will attack you with a re-raise that you can’t call, and if you’re betting into a calling machine amateur he will keep calling you down with nothing and win. Don’t try to semi-bluff in multi way pots with draws, this will usually require you shooting a second blank on the turn if the draw doesn’t come in and this can be quite un-profitable in the long run. Don’t try to make hero calls with small or medium pairs against amateurs. Remember, amateurs are allowed to have a hand once in a while also. When to leave the cash game is probably the most important factor that will determine your profitability as a poker player. As a modern day trader, knowing when to close the trade is equally if not more important than knowing which trade to open and when. There are three reasons which you should have in place in determining how and when to quit the game. When you start making mistakes due to the fact that your psyche has been affected due to previous hands or from playing too many hours. When the table has dried up; i.e. the fish have tightened up and are not giving away any more money. You have reached your profit goal, whether that is 50, 100 or 200 Big Blinds.